Late in 2015, the community Lhokseumawe Adventure Trail Community (Lhantac) menjajal waterfall 7 nymph. Watch the beauty of waterfalls that make visitors forget the tiredness of travel. There is no literature explaining why these natural tourist destinations are so named. Strong allegations, its beauty is up to 7 levels that make the local people pinned the name. Between one level with another level is about five meters with a height between 3-4 meters. Sourced from the flow of Krueng (river) Pase and Suak. The clear water drains coolness. The rumbling of the water that hit the rock sounded loud with a spark that let off steam. Mixed with a virgin forest that embraces the area. Make visitors feel at home for long. Feel the open-air atmosphere that reconciles the soul and reassures the mind. 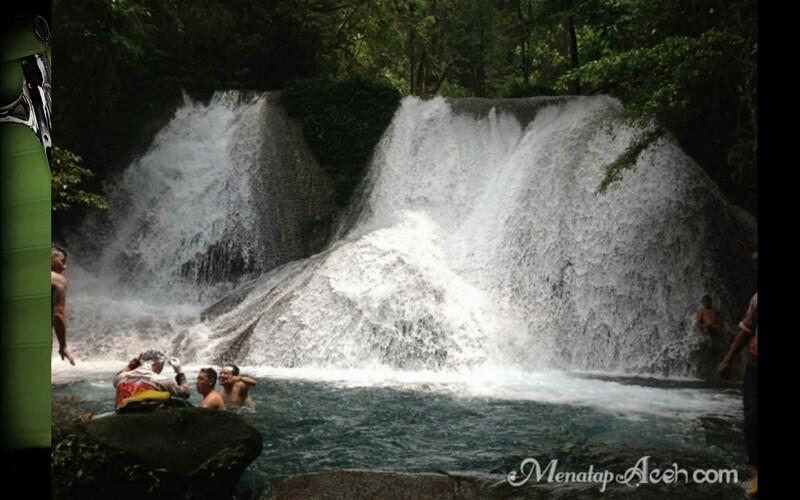 This waterfall is located in Simpang I Transmigration Mbang Geureudong Pase Sub-district, North Aceh District. Located about 50 Km from the city of Lhokseumawe. Need an extra struggle to get to this place. The location is hidden with a makeshift access to make the journey to the location is not an easy matter. If drought dusty roads and vice versa if rainy days the streets are muddy. The field is really challenging adrenaline. If departing from Lhokseumawe take the direction to the east, across Punteut District. At first the trip was comfortable with smooth road conditions terpal. But entering the forest forest area changed climbing. Motorcycle trailers please satisfy his hobby here. Because this type of 'iron horse' is suitable to be brought to the waterfall 7 nymphs that have not been much touched. You will cross the 'command barracks' line in Pulo Meuria Village, Geureudong Pase Sub-district, North Aceh District. During the conflict the area was known as the nest of the Free Aceh Movement (GAM). Splitting paya or Alue Tualang whose water flows into Keureuto River, North Aceh. Well! For you lovers of nature tourism as well as challenges, please try the waterfall 7 nymph. Enjoy the coolness of the virgin waterfall.